Appointment required even for Open House. This Cottage has been totally updated including the bathrooms and kitchen. The furniture is negotiable, so it is move in ready. 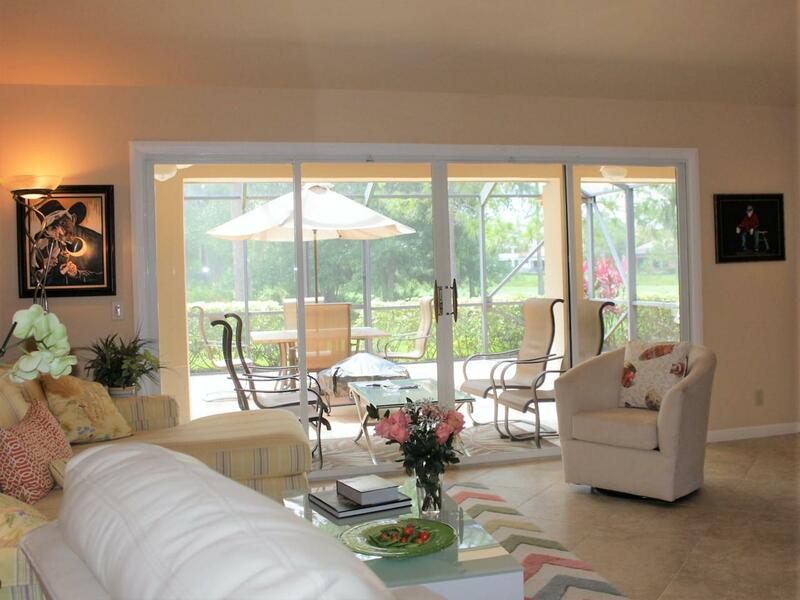 Living room, dining room, and master bedroom all look out on the screened in patio facing the 7th fairway. The house and one car garage can be expanded. Beautiful tile floors, wood cabinets, and granite countertops. Piper's Landing Y&CC is a Golfers', Boaters', & Tennis Players' Paradise. The award-winning Golf course has no trail, cart fees, social memberships, and no public access. Amenities 5 Har-Tru tennis courts, 49 Slip Marina, 31,000 sf clubhouse, fitness center, and 24/7 Security. $10,000 non-refundable membership fee and a refundable $65,000 Equity Contribution. Amenity fees $1,350/month. See Dues schedulePiper's Landing Y&CC Landing golf course was voted: ~ The best Private Golf course in all of Martin County by the Hometown News in 2018. ~ The best Private Golf course in Northern Martin County by the Hometown News in 2016 & 2017. ~ The best place to play golf on the Treasure Coast for 2017 by Indian River Magazine. Piper's Landing Y&CC Landing is in Martin County which has some beautiful white sandy beaches and miles of inland waterways including the Saint Lucie River and the Intracoastal Waterway. The area off the coast is known as the Sailfish Capital of the World. Downtown Stuart has a wide water view of the river, and it is loaded with boutique shops and fabulous restaurants. The whole area is far more relaxed, and the people are courteous and friendly. Piper's costs about a 1/3 to 1/2 of other areas to the South of us. West Palm Beach, Florida is just 45 minutes to South with for the big city experience and an International Airport. The Clubhouse was renovated in 2016 for $7.5 million. It came in on time and under budget because three of our members monitored the entire process. The clubhouse has a reception and library, three card and meeting rooms, four dining areas (a formal events room, a casual dining room, a covered outside dining area, and a large bar and lounge). There are several dynamite social activities including the start of the Season Gala, The New Year's Eve Party, The Member-Guest Valentines golf weekend, the Super Bowl party, and the fare-thee- well-end-of-the-season party. The event buffets are loaded Crab, Shrimp, Oysters, Lobster, Clams, Rack of Lamb, Prime Rib, Fresh Fish, and a whole room dedicated to just deserts. The Chef and food and beverage staff also serve delicious lunches daily and dinners three nights a week (Tuesday, Thursday, and Friday). MEMBERSHIP: EQUITY CONTRIBUTIONS: The Equity funds are what Home Owners Associations (HOA) use as Capital, just like any business. Equity provides operational funds in the bank. The Equity Contributions for Piper's Landing Y&CC Landing are one-time contributions split into two parts: ~ $10,000 is the Membership Application. This contribution is non-refundable after approval for membership. ~ $65,000 is for our Equity Fund which is the Capital for our HOA. Refundable to you on the sale of your home. HOMEOWNER ASSOCIATION (HOA) DUES FOR A COTTAGE: What is not evident in the dues is that roughly 44+/-% goes towards personal expenses. ~ The cost of the amenities for golf, tennis, and the clubhouse $ 1,350/month ~ The homeowner expenses you are reimbursing to Piper's Landing (below) $ 1,053/month ~ The total you pay as HOA dues and reimbursed personal expenses $ 2,403/month Expenses that a homeowner is reimbursing back to the HOA include: ~ Water and sewer charges. Piper's Landing Y&CC is on one master water meter. ~ Tips on all food and beverages purchases (including alcohol) in the clubhouse and on the golf course. ~ Mid-level Comcast TV cable charges. You pay separately for only for premium channels and internet service. ~ Lawn care and irrigation for your home and the community property. ~ Common area swimming pool expenses. Ask about our STAY AND PLAY MINI-VACATION package. Come and experience the Life Style of Piper's Landing Y&CC. When you buy a home in Piper's you are also gaining a Lifestyle that you will enjoy for years to come. Some of the members you meet in Piper's Landing Y&CC will become close lifelong friends.